Skip-level interviews are dialogs between a subordinate and the subordinate's supervisor's supervisor. They can be both heplful and hazardous. Here's Part II of a little catalog of the hazards. Three Card Monte, Jaffa, Israel. 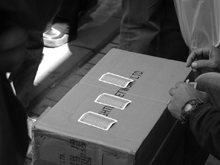 Three Card Monte is a con game, usually played on street corners. For an explanation and demonstration, see the video at YouTube, by MisMag822. In con games, a typical tactic is to establish in the minds of the "marks" a belief that their understanding of what is happening is superior to the understanding others have of what is happening. They do this by running demonstrations of the operation that are reasonably transparent. The marks then come to believe (incorrectly) that they have nothing to fear from the situation, and that they have an advantage. The con artists then follow these demonstrations with operations that appear superficially identical to the transparent demonstration, but which differ in ways that enable the con artist to harvest value from the transaction. Supervisors who want to calm subordinates' concerns about skip-level interviews can conduct benign interviews with some regularity. Then, after establishing in the minds of subordinates the belief that these interviews are constructive and benign, they have some freedom to employ them for purposes less benign. Photo courtesy Wikipedia, by ZioDave. As we noted last time, skip-level interviews can enhance organizational performance. But whether supervisors initiate them, or subordinates do, there are risks. Next time, we'll explore some hazards of subordinate-initiated skip-level interviews. For now, we resume our discussion of the hazards of supervisor-initiated interviews, using the name Frodo for the subordinate, Bilbo for Frodo's supervisor, and Gandalf for Bilbo's supervisor. When everyone understands that Gandalf conducts routine skip-level interviews, the mere fact that Gandalf has interviewed Frodo (or wants to do so) is unlikely to cause speculation about Gandalf's purpose. But when these interviews are rare, or when they're sudden or unexpected, or when Gandalf takes care to conceal the event, people begin to suspect that Bilbo might be in jeopardy, or might be in the running for a major promotion, or goodness knows what. To limit this risk, supervisors should conduct skip-level interviews with predictable regularity, though not very often. Making clear that skip-level interviews do occur — and that they're routine — limits the risk of subordinates misinterpreting the event as a sign of anything in particular. Supervisors who conduct surprise skip-level interviews almost certainly generate speculation about their own direct subordinates' job performance. If Bilbo knows that Gandalf is one who conducts surprise skip-level interviews, he can gain some protection from misinterpretation by advising his subordinates well in advance of any announcement that these things do happen. In effect, Bilbo would be making the interviews a part of the organizational routine, thereby removing the surprise and limiting — but not eliminating — the possibility that subordinates might try to manufacture meaning for the event. In some situations, Frodo might use the skip-level interview to tell Gandalf something that Frodo knows to be incorrect or exaggerated, to disparage Bilbo's performance. If Gandalf has an agenda, and if Frodo can divine it, Frodo can tailor his misrepresentation to what he believes Gandalf wants to hear. If he does, his effort is more likely to be effective. about the supervisor's purposemust be neither too trusting nor too skeptical. He is wise not to accept at face value anything he learns from Frodo, but just as important, he cannot seem to Frodo to be skeptical or distrustful of Frodo. He must take Frodo seriously, but he must take action only after confirming Frodo's assertions with third parties (other than Bilbo). If Gandalf does confront Bilbo with allegations obtained from Frodo — allegations that are unconfirmed, and which Bilbo knows to be false — then Bilbo must accept that he has a problem. Whether Gandalf is naively eager to find fault with Bilbo, or Gandalf is trying to assemble a case against him, Bilbo's remaining tenure as Gandalf's subordinate isn't likely to be a happy one. Would you like to see your comments posted here? rbrennQThxiKklWWRJBNGner@ChacUEHTdEqfLCklLQUaoCanyon.comSend me your comments by email, or by Web form. Most workplace communication training emphasizes constructive uses of communication. But when we also understand how communication can be abused, we're better able to defend ourselves from abusive communication. One form of abusive communication is deception. Skip-level interviews — dialogs between a subordinate and the subordinate's supervisor's supervisor — can be hazardous. Here's Part III of a little catalog of the hazards, emphasizing subordinate-initiated skip-level interviews. With the emergence of knowledge-oriented workplaces, counterproductive work behavior is taking on new forms that are rare or inherently impossible in workplaces where knowledge plays a less central role. Here are some examples. Narcissistic behavior at work threatens the enterprise. People who behave narcissistically systematically place their own interests and welfare ahead of anyone or anything else. In this Part II of the series we consider the narcissistic preoccupation with superiority fantasies. Narcissistic behavior at work is more damaging than rudeness or egotism. It leads to faulty decisions that compromise organizational missions. In this part of the series we examine the effects of constant demands for attention and admiration. See also Devious Political Tactics and Workplace Politics for more related articles. I offer email and telephone coaching at both corporate and individual rates. Contact Rick for details at rbrenUHnLacJFhwFeyxDcner@ChacYGGidapLvbgvbFLkoCanyon.com or (650) 787-6475, or toll-free in the continental US at (866) 378-5470.